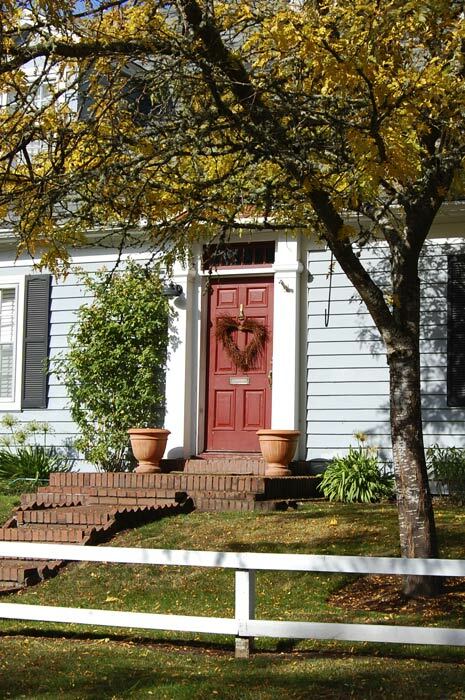 When looking for autumn decorating ideas for the front porch, ideas are often just around the corner. Ideas and inspiration can be found simply by driving through your own neighborhood. Today, I toured the local streets to see what seasonal touches caught my eye. The house color is the first thing that caught my eye in the photo above. The rusty red contrasts so nicely with the yellowing foliage nearby, it seems as if this homeowner designed with fall in mind. Sometimes it is the potential that is most noticeable. On this house, the annuals in the terra-cotta urns have been removed, leaving a space crying out for seasonal touches. A pair of large white pumpkins, a pyramid of gourds, a display of branches or berries, or even two globes of grapevine would fill the space perfectly. 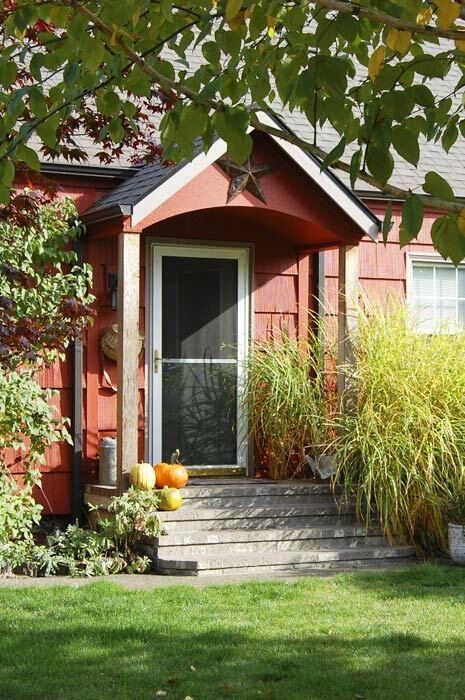 This homeowner cleverly tied accents to home color, with the orange pumpkin similar to the door color and white ghost reflecting the house trim. Now, the accents can stay small but still be noticeable. When your entryway is far from the curb, choose one big item rather than several small items. This large, decorated pumpkin in a witches hat is perfect for grabbing attention. Of course, a welcoming feel at your entry is always the right idea. 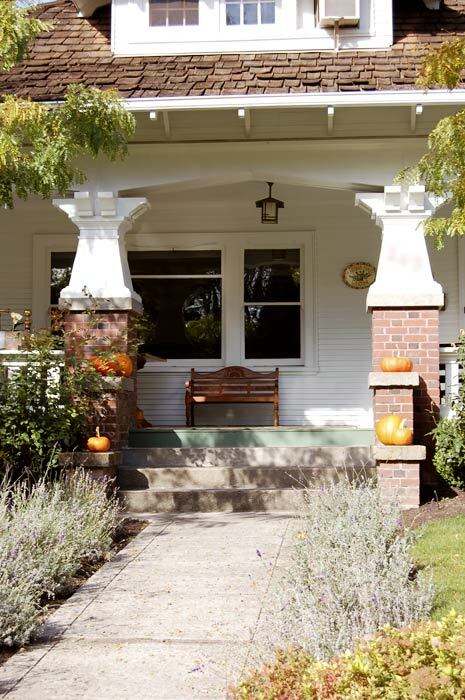 On this porch, the pumpkins lead you up the stairs to a cozy bench, perfect for a visit with your friends and family. If you look, you can find ideas and inspiration for seasonal decorating everywhere, even right next door. This post is a part of the Front Porches: A Fall Drive By sponsored by Melissa at The Inspired Room. Note: All photos have been taken either with permission or from public property, however house numbers have been blurred or altered as a courtesy.